This is the most serious problem. Experience shows that menus do not work equally well with all the popular browsers. The use of standards does not resolve the situation because some of the more popular browsers do not fully support the latest standards. In some cases, after placing a menu on the page you will find that the menu itself or elements of the page are not correctly displayed. Such an occurrence could cause you to waste time and energy correcting a code of the menu and/or a code of your site. Let's assume that you have placed the menu on your site and have completely adjusted it. The adjustments may seem perfect, but sooner or later there will be a need to change the structure or appearance of your menu. To make changes, you will need to study the code again, to edit images, etc. It is unproductive work. Usually, a problem arises after the release of a new browser version. Not all menu developers release updates on a regular basis. If so, you will need to adapt your menu to the new browser or to search for a new menu library on the Internet and spend your time adjusting it. To avoid such problems, it would be helpful to have a special EDITOR which allows you to easily set the colors and form of your menu, its structure and that allows you to create a complete menu script with just one click of the mouse. This script must be able to be easily integrated into any website and immediately show your menu when the page is opened in the browser. Inspired by the idea of such an editor, we have created a new WEB project: Drop Down Menu Generator. The main advantage of the system is that it does everything automatically, quickly, easily and displays the professional menu without additional customization required. From now on you will not need to dig into HTML, find the purpose of CSS classes, adjust for browser compatibility or use the graphics editor. The core of the system is a professional commercial product with a long history of development -- APNSoft Menu Control. This generates a script for your menu. The product is constantly evolving and improving. The regularly published updates are compatible with the latest browsers. A template defines the look of the menu. A template consists of a directory that contains the CSS file and a set of images (arrows, textures, gradients, etc.). To set a new color gamma for the entire template, just two mouse clicks are necessary. Using the Color Picker you choose the desired color. The program automatically calculates the color, brightness, and saturation of each menu part, and simultaneously changes the CSS code and the color of each pixel in the images. It is important to note that the library has a large number of ready-to-use templates. New templates are added on a regular basis. This simple editor, based on drag-and-drop functionality, enables you to easily create a menu structure that displays multiple levels of hierarchy. The button (+) adds an element. Each element has a button (x) to remove it from the structure. 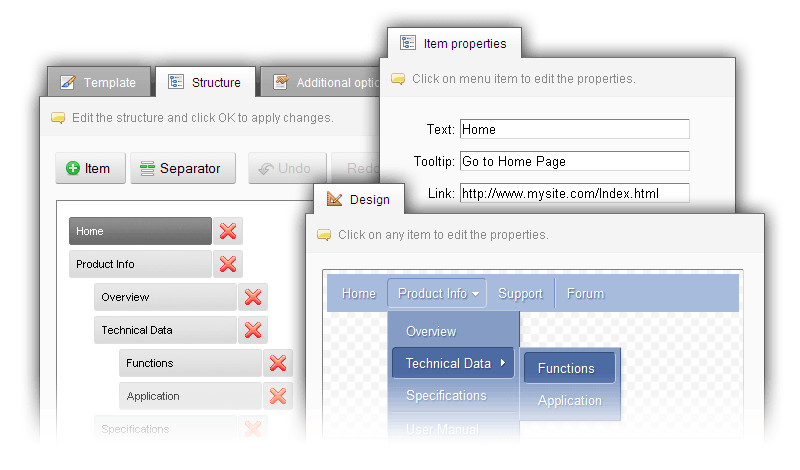 There are three types of menu elements: Links, Headers, and Separators. Once you have created your menu in the Drop Down Menu Generator, your menu can be downloaded as a ZIP archive. The archive contains only one directory, which includes images and main script file "MyMenu.JS". Menu structure and CSS style are inside the JS file. 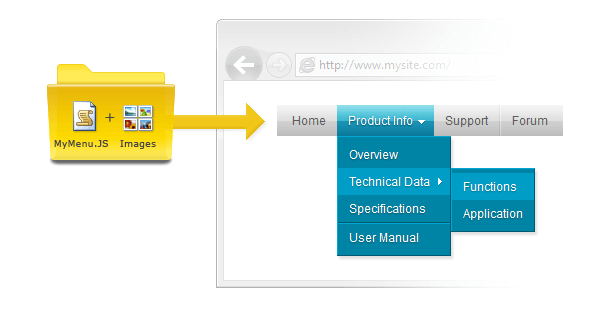 To place the menu on your web page, first, extract the folder from the ZIP file and place it in your WEB project. Then paste the simple code anywhere between the <body> and </body> tags where you want your menu to show up. Done! A single menu instance can be used to show your menu on multiple pages. Pages can be placed into subdirectories. Since a menu is a single folder, it is enough to replace the old folder with a new one to see an updated menu immediately on every page without additional effort. Since the launch of the Generator, many people have begun actively using our project. We have received a quantity of positive feedback. So, we intend to develop the project further. In the near future, we plan to add a library of icons, support for responsive menus, scroll bars for the high submenus, the possibility of using a simple HTML code in the menu elements, and much more. If you need technical assistance, please contact us. We will be especially glad to hear suggestions on how to improve our Drop Down Menu Generator.